We are able to offer advice on the most suitable structure for your business be that sole trader, partnership or Limited Company. We can talk you through the options available and the differing benefits such as tax advantages, ease of set up, financial implications and of course the level of accountancy fees. We can prepare business plans and cash flow forecasts, and assist with any financing requirements you may have. We will work closely with you and your bank manager to achieve the right financial package for your business. We will complete all registration requirements with HMR&C for example self assessment, VAT, PAYE etc and deal with company formations where required. 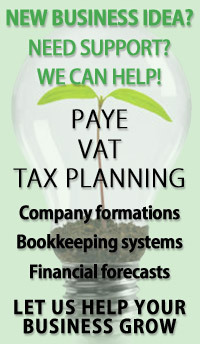 We will also advise on your internal bookkeeping systems to help ensure your records not only provide you with the information you require to effectively control your budgeting and cash flow but comply with any legal requirements, for instance VAT legislation, and are also are sufficiently complete to ensure accountancy charges are kept to a minimum. Throughout the early stages of your business and indeed when you have become an established firm we can help you get on with the job of taking your business forward by offering support services such as Payroll management, Vat return preparation, Management accounts and many more. We want to help your business thrive and grow and having started our own business are well aware of the many areas, other than financial, that people starting their own business need to address and will be happy to share our experiences with you.